I have been a big fan of isometric illustrations for some time now and last year I created a speed art turning numbers into isometric buildings. 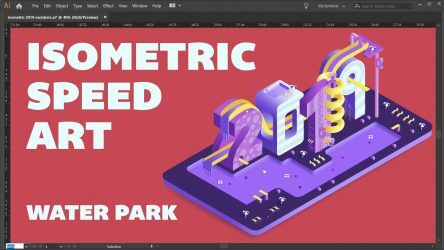 Hence I’ve created a new Isometric Illustrator Speed Art for 2019 using the numbers to create an isometric illustration with a water park theme. I usually work with my isometric grid, even though the SSR method is very popular and can speed things up. I just feel that the isometric grid offers me a better artistic workflow. The Isometric Illustrator Illustration for 2019 is kept in a colorful purple to pink and light blue colors with some yellow accents. I added some cute elements like isometric birds and an isometric duck :), just to name a few. With over ten years of Adobe Illustrator use, my aim is to help you create super cool designs by sharing my tips, inspiration and resources that I have gathered and learned throughout the years. I hope my knowledge and help will fuel your creative passion.